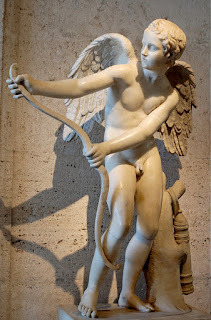 Eros | Learn about Greek Mythology,Greek gods,Greek mythology stories! Eros in Greek mythology, love's longing personified, is regarded as Aphrodite's constant companion, and according to the later idea, as her son. In their train are found Peitho ( persuasion) and the Charites, to whom Aphrodite is otherwise closely related ; for in the Iliad Charis is the wife of Hephaestus, while according to the Odyssey Aphrodite herself occupies this position. representing Eros as now flatteringly embracing, and again cruelly torturing Psyche (' soul '), who was pictured as a butterfly , or as a maiden with a butterfly's wings.